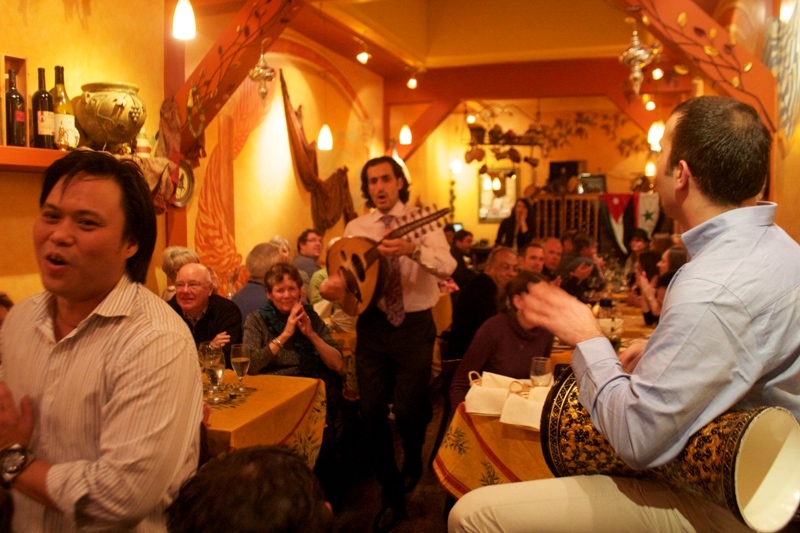 Alec Torelli checks out Dametra Greek Café in Carmel, California. We arrive at the Greek Cafe Dametra at 8 pm without a reservation. The place is packed. We stand at the door, huddled around other couples. Faisal, the owner, cheerfully welcomes us: “Come on by. We’ll fit you in. I just have to take care of something”. A few minutes later, he storms through the restaurant with a parade carrying drums, symbols and bells. They start playing an upbeat traditional Greek music and pulling ladies up to dance. It couldn’t be more authentic. When the festivities finish, we are guided to a back room with eight tables. Wine cabinets line the walls like bookshelves. Ambient lights create romance. It’s warm and inviting, cosy and beautiful. We don’t even bother the menu. Faisal earned our faith. After a new carousel of songs and dances, our Combination Platter arrives. They put all of Greece in it. Gyros, chicken kabab covered in a zesty garlic sauce, hummus, yogurt sauce, pita bread, crispy yellow rice and a salad made with romain lettuce, feta cheese, Kalamata olives and cucumbers in an oregano vinaigrette. We fight over the Gyro, thinly sliced lamb and beef seasoned with herbs, and immediately polish off the rice. It’s sweet and flavorful. The Chicken is next to go, falling off the skewer like a peddle to a rose. The Hummus, made with garbanzo beans, garlic, lemon, olive oil and roasted sesame seeds sauce, is delicate and fresh. We use the pita as a shove and sponge it not to waste any last morsel. The waiter doesn’t need to ask before clearing our plate. It’s blank. The Jerusalem Kafta Kebab is ideal for sharing. Seasoned ground beef, grilled to perfection, served with tomatoes and lettuce and wrapped in Lavash bread. We pick up our halves and take a bite. Our eyes meet and words are lost. Divine. 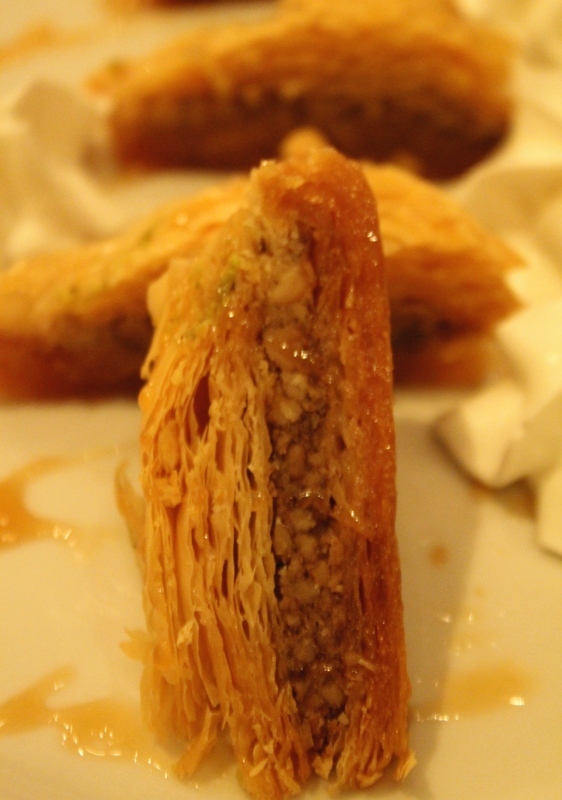 Following dinner, we sip some Muscato and gamble on Baklava. The dessert is a little too sweet and could have had more nuts. After such a fantastic meal we just want to save the amazing flavors of our food. We put the cake on the side and get back to the bread’s basket. There are still some drops of Tzaziki in our basin! Their Greek yougurt sauce with Persian cucumber, garlic and mint is a perfect conclusion. When the place closes, at 11:00 pm, we are the last to leave. It was unfortunate too, had they stayed open longer, we could have ordered another dish! It all started when he was 10. He was distraught about moving, but the man next door welcomed him with a huge styrofoam box of ice cream. Fourteen years later, he moved to Italy and fell in love with gelato, which inspired his first writings about food. Since then, his passion for culinary art has done nothing but grow. On a mission to find the world's best gelato, he travels, eats and writes for Still Served Warm.